Ezubao, an online financing platform, has allegedly absorbed about 50 billion yuan ($7.6 billion) in funds, with about 900,000 investors involved, the Xinhua News Agency reported Sunday. The platform was launched in July 2014 by Yucheng Group, which is based in East China's Anhui Province. After noticing some abnormal activities on the platform at the end of 2015, the authorities launched an investigation into the company, Xinhua said. Ding Ning, chairman of Yucheng, and 20 other people were arrested on January 14. 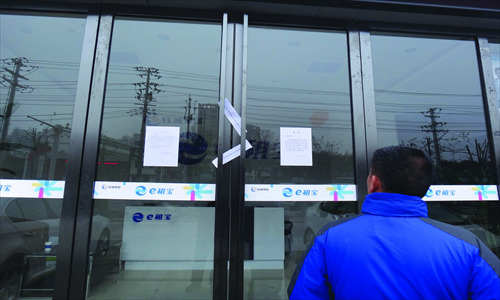 The police found that Yucheng and its affiliates did not have sufficient cash flow to operate normally as of December 5, 2015. Also, the company had transferred some of its capital and destroyed certain evidence, and some senior people in the company have fled, according to the police. "Ezubao is a Ponzi scheme," Zhang Min, a former senior executive at the company, was quoted as saying in the Xinhua report. According to Ezubao, the group's affiliated leasing companies first signed agreements with companies that operate projects. Then, under the model of assignments of credit, once the companies operating the projects got financing, they would pay fees to the leasing companies, which would then pay interest to investors as well as the principal amount of their investment, Xinhua said. However, over 95 percent of the projects on the platform were fake, according to Yong Lei, who was in charge of risk control at a leasing company under Yucheng Group, the report said. The platform, which claimed that it focused primarily on finance and leasing solutions, instead became a third-party payment channel to illegally absorb capital, the Xinhua report said. Many investors were attracted by the high returns Ezubao promised, Xinhua noted. The platform offered six investment products, offering annual interest rates of between 9 percent and 14.6 percent, much higher than for similar products offered by banks. "One of the company's employees told me that I would get the principal of my investment and my interest, despite the failure of the project," an investor surnamed Zhang was quoted as saying in the report. Another investor surnamed Xi told Xinhua that she was attracted by Ezubao's flexibility. For example, some money management products do not allow withdrawals to be made in advance, but that was not the case with Ezubao, she noted. Yucheng grew quickly for a year and a half, with large numbers of affiliated companies and contracted companies being set up around the country, Xinhua noted. Investigators also found that a "considerable proportion" of the money that had been raised from investors was spent on maintaining lavish lifestyles for senior executives and for company operations, including fueling the hype about its products. Ding spent more than a billion yuan on gifts such as properties, cars, and luxury goods, the report said. A big chunk of money was also spent on salaries, particularly those of top executives, the investigation found. For example, the salary paid to Ding's brother Ding Dian went from 18,000 yuan to a million yuan per month. Zhang Min, a former senior executive at the company, told investigators that 80 people at Yucheng received salaries of over a million yuan, and the company spent a total of 800 million yuan in paychecks within just a month in November 2015. The company has also spent over 100 million yuan on advertising since 2014, the report said. And to maintain a good reputation among investors, a lot of money was spent on luxury clothes for Ding's female secretaries. Ding said money raised on Ezubao was also used to cover operational costs for the company's other assets. False or exaggerated advertizing and the intention to spend the money on themselves constitute crimes of illegal use of public funds and fundraising fraud, Guo Hua, a law professor at the Central University of Finance and Economics, told Xinhua. Investigators said efforts are still underway to collect evidence and recover some of the money, to minimize losses for investors. They also urged affected investors to file reports with relevant law enforcement agencies.